Preston Leete Smith grew up in the farmlands of Connecticut. After attending agricultural school at Earlham College in Indiana, Smith returned to Connecticut and was a member of Walt Schoenknecht's New Haven ski club and a ski patroller at Schoenknecht's Mohawk Mountain. Smith's interest in developing a ski area reportedly began while he was on his honeymoon with wife Sue at Stowe. In 1954, Smith met with Vermont Parks and Recreation Commissioner Perry Merrill in regard to purchasing Ascutney. At that meeting, Smith was persuaded to look into the remote Killington peak. 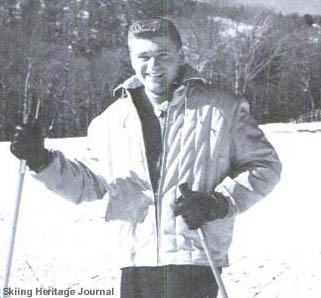 Smith and his wife moved to Killington in 1956 and opened the first phase of the ski area for the 1958-59 season. Killington was expanded to Killington Peak for the 1959-60 season and continued to grow at a staggering pace thereafter. In the late 1960s, Smith unvealed a village development plan. While some aspects were advanced, Smith would never complete the village. Also in the late 1960s, Smith oversaw the installation of the world's longest gondola. Known as the Skyeship, the gondola opened the new "Killington East" base area for the 1969-70 season. Plagued with cost overruns due to the complexity of the project, the installation bankrupted manufacturer Carlevaro & Savio and nearly bankrupted Killington. Frustrated with potential development inhibitors in Vermont, Smith's Sherburne Corp. purchased Sunday River in Maine, soon installing young Killington employee Les Otten as General Manager. The Sherburne Corp. would eventually finance the sale of Sunday River to Otten in 1980. Smith's Sherburne Corp. bought Walt Schoenknecht's prized development (after a series of sales and bankruptcies) Mt. Snow in 1977. The Sherburne Corp. would later be rolled into a new corporate identity for the two areas, S-K-I, Ltd., in 1984. S-K-I Ltd. would have its initial public offering in 1985, with Smith serving as Chief Executive Officer and Chairman of the Board. The growth of Killington continued in 1982 with the creation of the Northeast Passage complex. Served by New England's longest triple chairlift, the new base area was seen as a launching point for a planned expansion into an area known as Parker's Gore. The Northeast Passage base area, as well as the Parker's Gore plans, would both be abandoned after Smith sold Killington. Smith's S-K-I Ltd. would purchase another area, Carinthia, in 1986 and merge it with Mt. Snow. Two years later, S-K-I Ltd. expanded to the west coast, purchasing what would become Bear Mountain in California. Bear would be sold in 1995. In 1991, S-K-I Ltd. laid the ground work to eventually purchase Haystack in Vermont, leasing it and marketing it with nearby Mt. Snow. In 1994, S-K-I Ltd. purchased Haystack, Waterville Valley, and Sugarloaf. That same year, the Killington Skyeship was replaced with a new, shorter, heated gondola. Meanwhile, Les Otten's LBO Resort Enterprises was quickly growing. At this point, according to Pres Smith, "about 1994-5 my management team and I concluded that given ski industry circumstances and perceived resort values that we would likely see short to medium term growth as unrewarding and below par for our stockholders. We concluded that selling out for cash would be the prudent route." In 1996, Smith agreed to merge his company with former employee Les Otten's company. The resulting buyout was the basis of American Skiing Company, run by Otten. After selling his S-K-I Ltd. holdings, Smith eventually retired to Florida. In reflecting upon his time in the ski industry, Smith took pride in employing many full time, year round employees, as well as operating a ski area with the longest season in the Northeast.